The Seychelles have a total land mass of 455km² distributed over 155 islands, which makes it the smallest country in Africa. The total coastline of the islands is 491km. 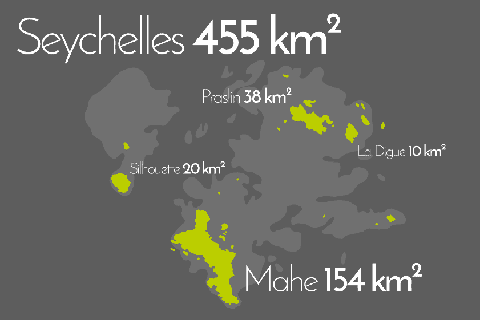 The biggest islands are Mahé (154km²), Praslin (38km²), Silhouette (20km²) and La Digue (10km²), all of which are granite islands as most other islands among the so-called inner islands. The outer islands are a group of coral islands that are smaller and quite scattered in the Indian Ocean. 58,61% of the land mass is protected which is the highest ratio in the world.